Critical architecture theory has had to engage with what Manfredo Tafuri defined as “urban ideology,” a conceptualization of the landscape: the urban, the rural and the in-between. Since that moment of internal crisis in architectural theory, the discipline had to engage, whether explicitly or implicitly, with the landscape as a “purely conceptual space” for architecture. Beyond the modernist critique of “type” based on form and language, much of architecture discourse in the last century has been engaged in this dialectic between autonomous architectural objects, and the space of the city, or the urban condition. This dialectic expands the formal investigation “between the role of the architectonic object and that of urban organization.”. 6 That is not to say that architecture engaged in urban ideology has only existed as contingent, what Hays would call an “instrument of culture” responsive to, or contaminated by the socioeconomic, political and technological processes by which it is generated. The argument made in this paper is that rather than purely a reflection of the processes that make the city, a critical architecture has emerged out of the abstraction of the landscape as a conceptual space, allowing ideas that range from the notion of region to the science of ecology to provide a new theoretical lens for architecture to observe, select, heighten and transform aspects of its situation, and to critically engage in proposing new formal, spatial and performance agendas for built form. It is important to differentiate site, which can be naturally conflated, with landscape. Landscape as a conceptual space, has always been more abstract and therefore broadly aligned with the idealized. Whereas site, as a political or physical limit, has always been a found condition, connected to reality, and it can be more commonly tied to the immediate social, political, economic and technological conditions. A critical difference is that landscape theory has given architecture new frameworks to select and edit attributes of its site or region, and to create a more meaningful dialogue with the broader cultural construct of landscape—as an evolving idealized space. This was only possible with the emergence in the late nineteenth century of a new disciplinary autonomy for landscape theory. This discourse in landscape transformed the idea of landscape itself from what Elizabeth Meyer described as a passive setting (or ground) for architecture—and James Corner characterized as a passive product of culture—into an active and strategic agent of culture. 7 Furthermore, it was the engagement of critical landscape theory with the field of ecology and the “aesthetics of sustainability,” that resulted in an evolution of the concept of landscape from its origins in painting into a field of dynamic systems. Examining this evolution in landscape theory, and the corresponding theories and practices emerging in architecture as a response, elucidates how ecological concepts of scale, site and systems have been translated into a new conceptual space or framework for formal investigation in architecture. Recently, landscape has dominated the discourse of ecological design and urbanism, inviting introspection in the field of architecture, as it seeks to redefines its role and relationship to the landscape. Over the last ten years the theoretical discourse of architecture has shown increased activity and interest surrounding to notions of site, region and landscape—terms that are likely borrowed from landscape theory. The publication of the book Site Matters in 2005, edited by Andrea Kahn and Carol Burns, was presented as the first significant effort at formalizing a theory for site as a conceptual structure in architecture, a subject in which the editors stated there was scanty literature. 8 Ten years later, we can no longer say that site occupies a marginal place in architecture theory. The theory of landscape urbanism, compiled in a volume edited by the architect Charles Waldheim, brings together multiple disciplines in conceptualizing urbanism as landscape, and describing new forms of collaboration, what James Corner has referred to as hybrid forms of practice. 9 These have been followed by numerous publications, such as Design Ecologies, where ecological thinking is central to design in ways that are less concerned with objects or space, and more with performance and dynamics.10 This shift in attention has been driven by an increased attention to the environmental crisis, the importance of the field of sustainability, and the search for solutions in ecological planning to replace the version of twentieth century planning that had been discredited by critical theory or challenged by new forms of growth that resist older models and solutions based on the morphological categorization of urban fabric. However, it is important to recognize that, although more visible in the discourse now, the exchange of ideas between landscape and architecture theory is not a recent development, and in fact has been a part of critical architecture practice for a long time. What we can see in a brief historical survey is that the notion of landscape has provided a conceptual space for architecture for over a century. In this conceptual space the discipline of architecture has engaged with theories of place, regional identity, nature and lately the ecological. Through the following sections this paper examines some of the ideas exchanged between the fields of architecture and landscape theory at critical moments in history. The objective is to understand how the cultural and collective imagination of a territory – whether it is imagined as a natural condition or a constructed ecology —defines a conceptual space for critical architecture to be practiced. We can find similar critical responses and moral questions in earlier landscape theory. The idealized landscape types of the picturesque and pastoral in earlier landscape theory generated what Elizabeth Meyer describes as critical and alternative views built around the notion of site, which emerged in the late nineteenth and early twentieth century: suggesting the observation of the site’s precise conditions, the selective representation of its features, and its editing to improves found conditions. 14 Specifically, Meyer explores how landscape theory questioned the morality of “transposing idealized landscape types” to a new continental, regional or local condition, referencing examples of early work in American landscape architecture. These alternative theories prioritized scale and local or regional ecology rather than the imported aesthetic principles of idealized typologies. The conceptualization of mechanisms and organizing principles of ecosystems is fostering a new collective imagination of what comprises the landscape. Through this lens, in the context of urbanism, the conceptual space of the city is a dynamic system in which all parts, buildings and natural systems, are designed and constructed as interconnected, and interdependent. This changing paradigm of landscape has profoundly shifted the conceptual ground on which architecture is built. Therefore the urban landscape is not a vacuous or pure conceptual space where architecture exists in isolation. Instead, much like the discipline of landscape ecology has transformed design through systems thinking, architecture in the urban landscape no longer designs autonomous objects in sites, but instead defines different conceptual boundaries to define ecosystems at different scales. The autonomy of the architecture object emerges from occupying a unique niche in the landscape ecology. Beyond the abstract notions of continuous space, new interpretations of modernism’s most significant work reconsider the notion of landscape in architecture. Critical reinterpretations emerged of a modern architecture that was conceived as a constructed landscape, rejecting the notion of landscape as purely external condition bounded to nature. Caroline Constant’s new interpretation of Mies van der Rohe’s German pavilion in Barcelona (1929) suggests that the pavilion was conceived as a landscape by rejecting historical references to the pavilion of the English landscape garden, undermining its status as an object, overcoming the static quality of the picturesque object terminating a vista, and denying any symbolic references to nature.16 A recent exhibition of Le Corbusier’s work at the Museum of Modern Art in New York, revisited his work through the lens of landscape, analyzing his drawings and his work both as an instrument to view the landscape and as constructed landscapes in themselves. For example, in the Villa Savoye (1929-31) Le Corbusier explored architecture as both framed view that borrowed the distant landscape, and as constructed landscape through the device of the architectural promenade that culminated in the roof terrace. While it is true that abstraction of modernism was challenged by site concerns, as Meyer suggested, some manifestations of modernism did engage with the conceptual space of the regional landscape, as a reaction to that same abstraction, and as a form of criticism in architecture. This development paralleled what Elizabeth Meyer described happening in landscape theory: the reaction to the transposition of idealized types and the formulation of concepts tied to place. 22 Reflecting the discourse in the landscape field, we begin to see distinctions between landscape (the generalized) and site (the specific) emerging in the conceptual space of architecture. Frank Lloyd Wright appropriated the landscape of the Midwestern prairie as a conceptual space for a new language, which generalized and systematized formal relationships to solar orientation, climate, views, spatial continuity, scale and hierarchy in the production of architecture that was specific to the northern American landscape, but that was flexible enough to engage with multiplicity and specificity by being site-inflected. This language emerged from the abstraction of formal qualities of a region. Region as a concept had been prevalent in the discourse of landscape theory. The translation of region to architecture was more formal than ecological, but it provided a renewed autonomy to the discipline so that the boundaries of the region were reinterpreted as cultural in many different sites. Although his urban proposal of Broadacre City also failed to address the traditional city, and completely rejected it, its organizational principles were, for better or worse, based on the adaptation of a uniquely regional American landscape, and the desire, although naïve, to connect people to nature in daily life. Similarly, the work of Alvar Aalto adapted modern functionalism to the regional landscape of Finland through formal, material and tectonic expression of an architecture that was conceived as landscape. The Säynätsalo Town Hall (1949-52) by Alvar and Elissa Aalto is an example of this approach. This project has been described as inspired by the landscape of the Italian hilltop town center. The Aaltos situated and generated a new language for modern architecture by importing a traditional image of the civic landscape as an architectural typology, transforming it through the material and topological integration of the building with the Finnish landscape. (Fig. 1) Combining qualities of its natural and cultural landscape: the mediation of light through structure, the vegetated surface and the topographical form of the building, were engaged in, transforming a single architectural intervention into an idealized landscape. Although the building emerges from the abstraction and importation of the image of a foreign landscape, the spatial, formal and material operations engaged with the real site and the Finnish landscape in meaningful and humanizing ways . Similarly, Aalto’s urban proposals followed the ideas of standardization of early modernism, humanized and adapted to the cultural and natural landscape of Finland. He said of standardization: “nature herself is the best standardization committee in the world, but in nature, standardization is almost exclusively applied to the smallest possible unit, the cell. This results in millions of flexible combinations that never become schematic. It results in unlimited riches and perpetual variation in organically grown forms. We must follow the same path in architectural standardization.” 23 In that context, the objective of prototypes was not their endless repetition, but the infinite variation that humanized and contextualized them to their particular landscape. Eeva-Liisa Pelkonen argues that Aalto had an ecological view of architecture and planning, even though he did not use the term, because his thinking was “focused on the interactions between organisms and their environment.” 24 Alto’s schemes, including his theoretical city called “An American Town in Finland,” developed while he was teaching at MIT, explored how the standardization of prefabricated housing could be recombined and adapted to site specificities and landscape conditions. 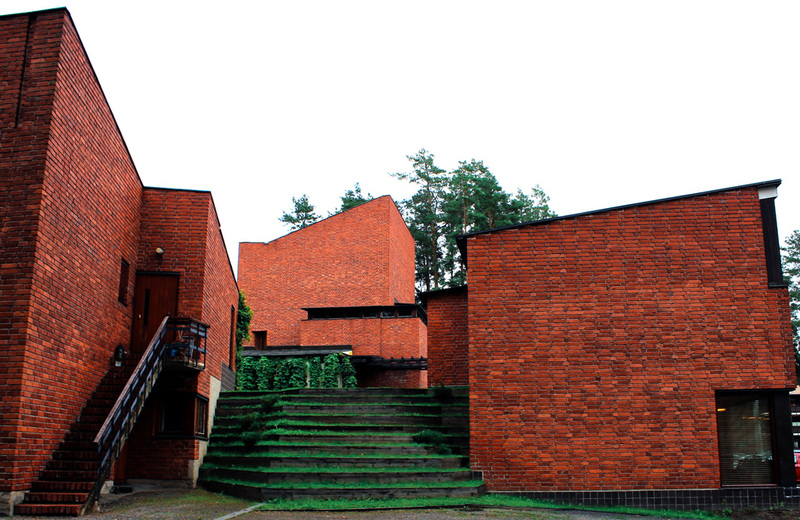 Alvar Aalto, Town Hall, Säynatsälo, Finland, 1951. The building creates a terraced landscape the opens the courtyard of the town hall along one corner to spill into the surrounding woodland. The evolution from landscape as natural condition, against which the technical object sits, to architecture as a constructed landscape, has given way to a recent view of landscape as ecology. The metrics of ecological landscape are defined by performance, process and relationships of its parts. The contemporary discourse of landscape and urbanism is less concerned with visual or formal qualities, but with the ecological performance of form. According to the landscape architect and theorist James Corner, this new view of landscape invites a reinterpretation of the most significant spaces of the nineteenth century landscapes through an ecological lens. For example, the value of Olmsted’s landscapes today, are less representational or aesthetic, but more on their role in the city as “ecological vessels and paths”. 25 The ecological lens of the landscape constitutes a profound shift in urban ideology. In the current state of environmental crisis, engaging landscape ecology as a conceptual space for architectural production is critical to make the discipline relevant to contemporary life. Architecture can engage the current agenda of the landscape discipline in constructing or restoring designed ecologies, by building on the notions of city as nature and architecture as landscape. The “disciplinary contamination” Elizabeth Meyer has described as “the intermingling of aesthetic discourses and conventions” with knowledge from other disciplines, such as geology and ecology, enriched the vocabulary of landscape architecture. 26 Similarly, the disciplinary contamination from landscape and ecology is proving enriching to architecture. A critical contemporary practice understands the performance of architectural form as an experiential and environmental device integral to landscape ecologies. In contrast, sustainability in design, its metrics and aesthetics, has been explored for quite some time. But sustainability is focused on optimization, often pursuing notions of self-sufficiency. In that conceptual framework, the building can be conceived as an island, or its performance measured in terms of degrees of independence (e.g. net-zero, off-the-grid). A shift to true ecological thinking focuses on relationships. Most importantly, it recognizes that any act of building transforms and reconstructs a large territory, will affect or connect to infrastructural networks far beyond what we usually comprehend, and to an existing ecology that is complex and diverse. Therefore it demands that the landscape and the architecture are not reductive, and instead be thought of as integral to each other, in terms of systems and not objects. Form is generative of performance, and although conceptual frameworks and a degree of abstraction from the real world are still needed to comprehend those complex systems and relationships, this generates a different kind of autonomy. Hay’s description of a vacuous conceptual space for the autonomous object has been transformed into a conceptual framework to explain and reimagine highly complex and contingent systems. New forms of critical practice have emerged in the last few decades, by adopting the landscape field’s ecological thinking into the conceptual space of architecture. Some notable collaborations between architecture and landscape practices are resulting in an ecological approach to urbanism that reframes architecture as an active agent of the landscape. The type of projects they develop do not fit Hay’s definition of contingent architecture that is a cultural product, a reflection of socio-economic structures, or conventions of practice. These projects not only are contingent to ecological conditions, but in their effort to construct a new landscape ecology, they create ecosystems and define ecotones in the urban environment, restore relationships, provide ecosystem services and heighten the awareness of the systems that support urban life. The architecture and landscape generated from this way of thinking become singular forms, responding to climate and assertively creating new micro-climates. The field of ecology is inherently about relationships, developing abstract models of representation to diagram and explain complex and contingent systems. As a conceptual space for architecture landscape ecology provides a framework to categorize, analyze, select, and engage with the contingencies and performance of systems. Frameworks of ecological performance allow architectural form to engage complexity, and to define its active role as consumer and producer of ecosystem services. Architecture in this context is not a passive object sitting on scenery, but instead must become an active agent in restoring or constructing new urban ecologies. Two significant spaces in the urban landscape of Brooklyn: the Botanical Garden at Olmsted’s nineteenth century Prospect Park and the new Brooklyn Bridge Park being built along the waterfront, provide didactic examples of this critical form of hybrid practice. Unlike much of the urban environment elsewhere, these two landscape spaces exist in an intensely dense and complex urban condition and are therefore clearly defined by distinct constructed ecological boundaries between the seemingly “natural” and the “built”. These classifications are in themselves problematic, as an ecological view of this landscape would suggest there is nothing strictly natural about the open space, and nothing strictly unnatural about the urban fabric. The terminology has been discussed elsewhere at length, and that can be the topic of another paper. What is relevant about this distinction is that these two spaces, designed at two very different times in history, perform important ecological functions in the cultural and physical landscape of the city. Two architectural projects within these remarkable landscapes illustrate the output of practices that are deeply committed to a collaborative and integrated model of architecture and landscape, developing singular forms that are formally experimental but not self-referential, and that are generated from an understanding of the human and natural ecology of the site in ways that make those systems legible. Both projects illustrate that an ecological approach to landscape creates a conceptual space where architecture cannot be objectified or reduced to categories of autonomous or contingent. Weiss Manfredi (architects) with HM White (landscape architects): Brooklyn Bridge Botanic Garden, 2012. The building on the right sits parallel to the berm that separates the garden from the parking lot. 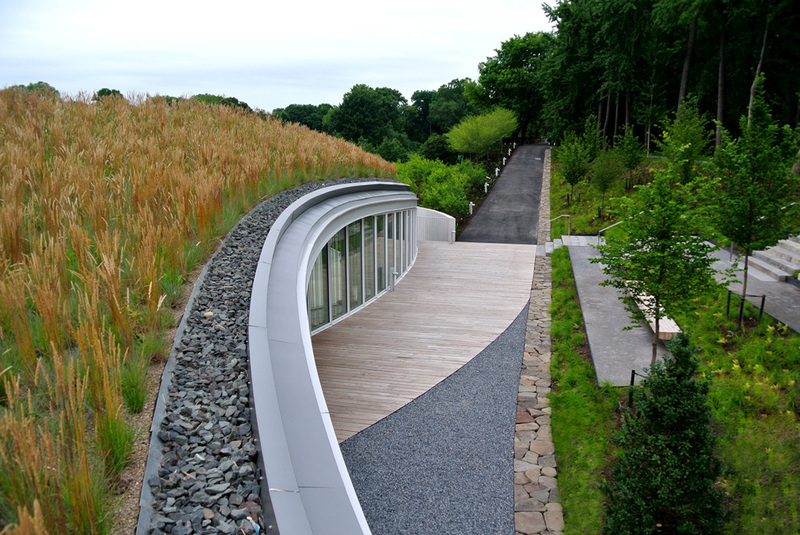 The paths of the landscape cut through the volume of the building, opening on the other side to the rain gardens. The practice of Weiss Manfredi has built a body of work that is characterized by the integration of building and landscape in cultural and performative ways, always leading large teams of experts in projects were legible forms on the land reveal spatial, performance and material continuities between the realm of building and site. In this project they worked with HM White Landscape Architects to expose and make legible the role of building as ground, and the ground as built form. The landscape architects describe the building and the immediate site as a system of storm water management. This integrated system also creates a new path for the curated display of plant life and creates new surfaces for biodiversity, but in this case the building creates much of the ground for that life on its roof. (Fig. 3) As a didactic landscape, the storm water management system is the most visible way to understand the role of a constructed landscape-based landscape system that integrates building and site. Other systems integrate building and site in less visible but equally didactic ways, such as a geothermal system that exchanges energy with the ground to heat and cool the building using local energy. The architects called the garden a “constructed natural environment,” based on how the design of the landscape employed trees and berms to separate what they call an “oasis” from the neighborhood. 31 Conversely, the building takes on a role of constructed landscape, by creating a new edge or strengthen the boundary between street and garden, with a built form that rather than separating and formalizing, becomes a new threshold between two landscape conditions. Similar to Le Corbusier’s work at the Harvard’s Carpenter Center, there is an ambiguity between building and the landscape created through the weaving of paths that make the volume less legible as object. The lamination of the organic form and the vegetated surface of the building onto the berm reinterprets its form and function as an “emergent topography and constructed landform,” that creates “an inhabitable extension of the berm.” 32 As you walk through the plaza and cross the threshold between the two pavilions of interior space, the formal structure of the building unravels into layers of structures, canopies and paths that formalize the transition into the next episode of the garden. This is an approach to building that views architecture as an instrument for human and landscape ecologies to become legible and integrated constructs. Although as a form the building still operates within the distinctions of natural and urban, its spatial experience and performance reveals a landscape that is highly integrated and revelatory of the designed nature of the urban landscape. Weiss Manfredi (architects) with HM White (landscape architects): Brooklyn Bridge Botanic Garden, 2012. Green roof in the foreground and berm in the background. Nearby, Brooklyn Bridge Park (2003-present) is a very different landscape, focused less on preservation or reinterpretation of a historic landscape, but instead on the ecological restoration of the coastal environment. Unlike Prospect Park, the landscape of Brooklyn Bridge Park is more legible as a construction, repurposing a cargo shipping and storage facility on the waterfront of Brooklyn. The work by landscape architects from Michael Van Valkenburgh Associates (MVVA), is quite explicit about its constructed nature, but also assertive about its ecological agenda in reusing this industrial landscape. The design of the park is redefining the edges of the piers, and reconstructing its surfaces as an open urban park space. This constructed landscape also performs important ecological functions that are intended to improve the resilience of the urban environment to storms and salt water floods, that act as an infrastructure of acoustic absorption to minimize the impact of the highway in urban life, and that provides a resilient coastal ecosystems to sustain plant and animal life within intense human activity along the waterfront. The language of the park is not picturesque or pastoral, nor does it invest in the distinctions between natural or urban. 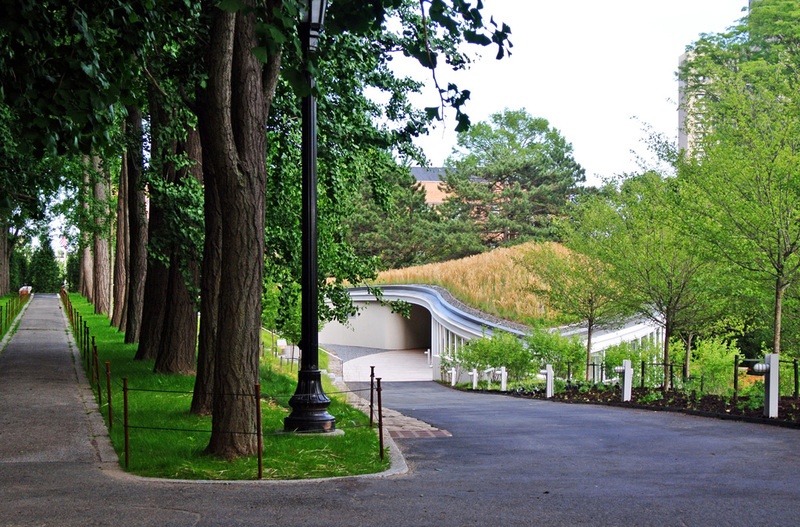 The park is a dialogue between enhanced nature and urban infrastructure. In this project, MVVA, as the lead designer, invited the office of Maryann Thompson Architects (MTA) to design the structures within the park. The collaboration between these firms over the years has generated a significant body of work that includes public spaces in the Don River Park in Toronto, the Brooklyn Bridge Park, and currently the visitor center at the historic Walden Pond, among other projects. The architecture of the Warming Hut at Pier 6 (2012), rather than a new construction, repurposed and reinvented an industrial building from the site, transforming it into another form of landscape experience. The work of MTA is known for its integration of building and site, and the creation of unfolding spatial sequences that de-objectify architecture. The principal of the firm is trained in both architecture and landscape architecture, and has built a practice known for collaborating with notable landscape architecture firms in projects of many scales. In this project, the architects turned the building from static object into a dynamic spatial sequence by exposing the original concrete core of the building, and recladding it with a spiraling ramp that leads to a newly occupied roof terrace. (Fig. 4) No surface of the building is understood as wall or roof in the traditional sense. 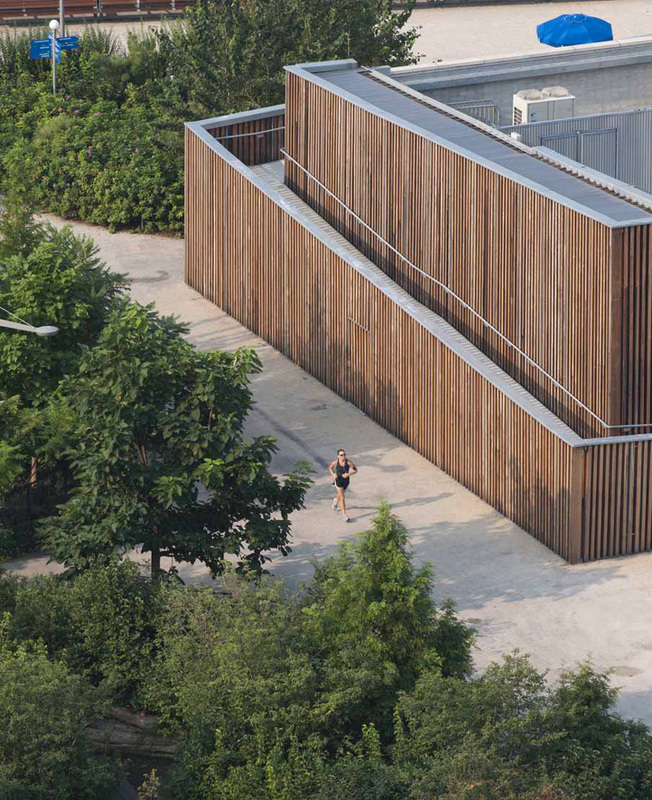 The ramp wrapping the building creates a thick skin constructed with reclaimed timbers from the demolished industrial structures of the park. The same timbers are used for park furniture throughout the park. The louvered skin around the ramp creates a layered reading of the object, and an experience of dappled light that resembles a woodland condition. Maryann Thompson describes the layered skin of the spiraling ramp as “mimicking the unfolding qualities of the landscape” creating a “diaphanous counterpoint” to the landforms of the park and the water. 33 This architecture is engaged conceptually and materially with the reuse of an industrial landscape. The resulting sculptural form of the architecture emerges from interpreting patterns of movement on the designed landscape, pragmatic considerations of accessibility, and the material ecology of the site. (Fig. 5) The experience of the form is understood as an unfolding landscape condition that could not be generated absent the commitment to operate within the conceptual space afforded by this new landscape. Maryann Thompson (architects) with Michael Van Valkenburgh Associates (landscape architects). Brooklyn Bridge Park Pier 6 Warming Hut, 2012. View from above, showing ramp leading to roof terrace. Maryann Thompson (architects) with Michael Van Valkenburgh Associates (landscape architects). View of Warming Hut, 2012, from the space of the Brooklyn Bridge Park Pier 6. The construction of the building as a landscape has a long tradition in modernism. The use of continuous vertical and horizontal surfaces that are continuous from building to site, are increasingly common. The use of site-inflected forms, the thickening of the building edge, and the primacy of filtered light, are themes that have been rewritten in many projects by these and other practices leading in this form of hybrid practice between architecture and landscape. What transcends the formal language, is how these practices are engaged in creating new cultural forms reframing the older notions of autonomy and contingency in the discourse of architecture by considering an ecological view of form that asks critical questions about what architecture should be autonomous from—the social, economic and internal sources of disciplinary inertia driving much of the built form in the built environment—but also by being critically selective of what architecture should be contingent to, by theorizing meaningful and transformational connections with urban ecologies. José Rafael Moneo, The Solitude of Buildings : Kenzo Tange Lecture, (March 9, 1985), George Gund Hall (Cambridge, Ma. : Harvard University, Graduate School of Design, 1986). K. Michael Hays, "Critical Architecture: Between Culture and Form", Perspecta 21 (1984): 14-29. doi: 10.2307/1567078. Rafael Moneo, "On Typology", Oppositions: A Journal for Ideas and Criticism in Architecture 13 (1978): 22-45. Manfredo Tafuri, "Toward a Critique of Architectural Ideology", in Architecture Theory since 1968, K. Michael Hays ed. (Cambridge, MA: USA : The MIT Press, 1998). Simon Swaffield ed., Theory in Landscape Architecture : A Reader (Philadelphia : University of Pennsylvania Press, 2002). Carol Burns and Andrea Kahn eds., Site Matters : Design Concepts, Histories, and Strategies (New York: Routledge, 2005). Charles Waldheim, The Landscape Urbanism Reader (New York: Princeton Architectural Press, 2006). Lisa Tilder, Beth Blostein, Design Ecologies Essays on the Nature of Design (New York : Princeton Architectural Press, 2009). Manfredo Tafuri, "Toward a Critique of Architectural Ideology", 8. Elizabeth Meyer, "Site Citations", in Site Matters : Design Concepts, Histories, and Strategies, Carol Burns and Andrea Kahn, eds., (New York : Routledge, 2005), 92-129. Elizabeth Meyer, "Situating Modern Landscape Architecture," 1992, in Theory in Landscape Architecture : A Reader (Philadelphia : University of Pennsylvania Press, 2002), 21-31. Caroline Constant, The Modern Architectural Landscape (Minneapolis : University of Minnesota Press, 2012). K. Michael Hays, "Critical Architecture: Between Culture and Form", (vol. 21, 1984), 14-29. doi: 10.2307/1567078. Elizabeth Meyer, "Site Citations", 94. Alvar Aalto, "Influence of Structure and Material in Contemporary Architecture", in His Own Words (New York : Rizzoli, 1998). Eeva-Liisa Pelkonen, Alvar Aalto: Architecture, Modernity, and Geopolitics (New Haven : Yale University Press, 2009), 185. Elizabeth Meyer, "Site Citations..." cit. For further discussion of this topic, see Laboy, Fannon, “Learning Comprehensive Building design through a Resilience Framework”, presented at the conference “Architecture and Resilience on a Human Scale” in 2015. In that paper authors quote from C.S. Holling, “Resilience and Stability of Ecological Systems,” Annual Review of Ecology and Systematics 4 (January 1, 1973): 1–23. doi: 10.1146/annurev.es.04.110173.000245. Rolf Pendall, Kathryn A. Foster, and Margaret Cowell, "Resilience and Regions: Building Understanding of the Metaphor", Cambridge Journal of Regions, Economy and Society 3, no. 1 (March 1, 2010): 71–84. doi: 10.1093/cjres/rsp028. Clifford A. Pearson, "Groundswell", Architectural Record 200, no. 7 (July 2012): 74. Michael A. Manfredi and Marion Weiss, Public Natures : Evolutionary Infrastructures, 2015. Maryann Thompson, The Warming Hut at Brooklyn Bridge Park. Project Description. http://maryannthompson.com. K. Michael Hays, "Critical Architecture: Between Culture and Form", vol. 21 (1984): 14-29. doi: 10.2307/1567078. Figure 1. Photo: Michelle Laboy. Figure 2. Photo: Aaron Booher. Figure 3. Photo: Aaron Booher. Figure 4. Photo: Chuck Choi Photography. Figure 5. Photo: Chuck Choi Photography.